Jean-Christian Knaff lives and works in Toronto where he has founded with his wife Claude Miceli, their own company, Knaff and Miceli. He teaches illustration at the Ontario College of Art & Design, where he is Chair of First-Year, Design. Knaff's animation, The Wild, Wild Circus Company was nominated for the Nicktoons Animation Festival in the US and is currently aired on the YTV network in Canada. He won the UNICEF award at Annecy International Animation Film Festival and a gold medal at the New York International Animation Film Festival. Though born in Canada, Jacqui Oakley spent her formative years in Bahrain, Zambia, England & Libya. In 1989, she returned to Canada where she graduated from the illustration program at Sheridan College's School of Art & Design. She now works as a freelance illustrator & artist. Jacqui's paintings have been exhibited in Toronto, L.A., San Francisco, Philadelphia, San Diego & Shanghai. Gary Taxali is a Toronto-based acclaimed contemporary artist and illustrator known for his retro stylized art in the realm of pop. He was born in Chandigarh, India and raised in Toronto, Canada. Taxali is a graduate of The Ontario College of Art and Design University (OCAD). He has exhibited in many galleries and museums throughout North America and Europe including The Whitney Museum of American Art, The Jonathan LeVine Gallery, The Antonio Colombo Gallery, Steve Lazarides/The Outsiders, and The Andy Warhol Museum. Anson Liaw is an illustrator based in Toronto, Canada. Upon graduating from the Ontario College of Art from the Communication & Design Department Design Advertising Program in 1989, his versatile illustrations have been an integral part of many projects ranging from magazines, book publications, corporate, packaging and advertising communications. His illustrations take on critical views; both light and heavy about life in the world around us and that deals with social, political, cultural issues and lifestyle subject matter. INSTUDIO asked 2016 Illustration grad Kelly Ye for her take on February’s most famous holiday. View more of Kelly’s work online. 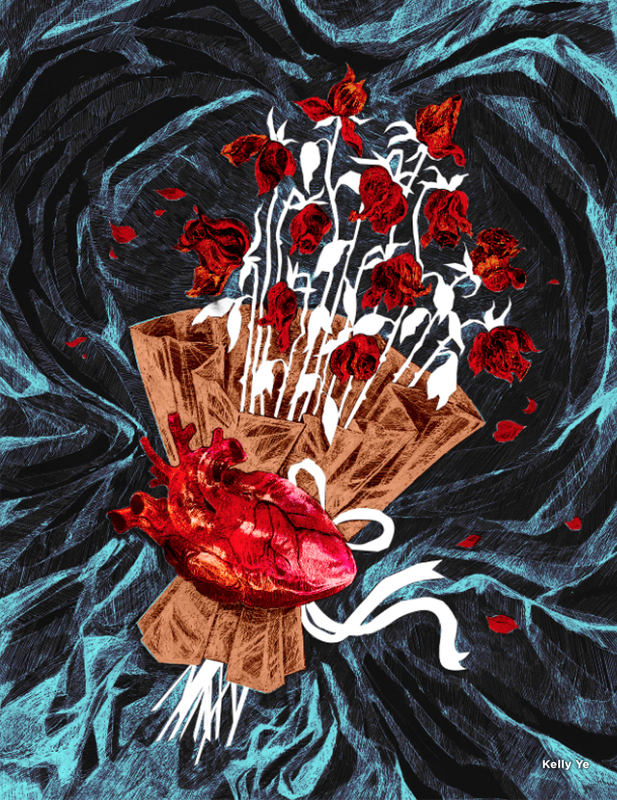 This illustration’s theme offers a dark take on one of the most commercialized of holidays: Valentine's Day. I adopted a literal interpretation of the idea of giving someone your heart, exploring the inherent vulnerability in the expression. Love can be both bitter and sweet, contrary to the happy portrayal of Valentine's Day, and I wanted to show a more twisted side, depicting a love not received or returned. Illustration Assistant Professor Jody Hewgill's series “Night Parade of 100 Demons” has garnered an Award from The Society of Illustrators. The 4 paintings are acrylic on birch panel, and are based on demons from Japanese folklore Hyakki Yagyo. They were created for an exhibition at Northern Contemporary Gallery curated by Histoshi Murakami and Andrew Foerster in Toronto, October 2016. OCA Alumni Anita Kunz, OCAD University Faculty of Design members Kathryn Adams, Blair Drawson and Anson Liaw have created some artwork that will be donated to help raise money to feed and house previously distressed and/or abused monkeys at the Story Book Farm Primate Sanctuary. Illustrator artist and OCA Alumni, Anita Kunz is organizing this event in-conjunction with the Story Book Farm Primate Sanctuary and has received and collected over 70 plus pieces of artwork from various wonderful contributing illustrators and artists which will all be auctioned off. All money will be donated to help feed and house the monkeys at the Story Book Farm Primate Sanctuary. A one day fundraiser event is scheduled to happen on Thursday, March 30, 2017 from 6:00 to 11:00 pm at a location to be announced soon. Martin Wittfooth was born in Canada in 1981. He earned his MFA from the School of Visual Arts in New York City in 2008. Wittfooth's work has been exhibited in galleries and museums worldwide, with solo exhibitions in New York City, Los Angeles, Seattle, and Montreal. His paintings have also appeared in numerous publications, including cover features in New American Paintings, Hi-Fructose, and American Artist, to name a few. He has lectured at various art institutions, including Maryland Institute College of Art in Baltimore, Ontario College of art and Design in Toronto, and The Museum of American Illustration in New York City.